Everything is harder when you are doing it on your own. That’s the first idea people need to understand before they decide to self-publish instead of seeking an agent or a traditional publisher. While working on your next project (book, painting, t-shirt design, etc. ), you have to make it easier for people to find your work. Authors who do not have a global reach need to start small in their home towns and build from that base. This is the easy part. Anyone can set up a free website, run a Twitter/Facebook page, and purchase a cheap domain to bring it all together. Those who are more advanced use email lists to focus the attention on their audience. All of this costs less than you might think. The greatest expense is time, which is always in short supply. Not one part of this is local, but it helps you to be seen as more credible when talking to local businesses. The first thing I did was hitch up to a worthy cause close to where I live. The Metropolitan Community Church of New York specializes in caring for the needs of LGBT homeless youth. Often, these kids are on the street because they were born into intolerant or abusive homes. You can read more about them here. A major chunk of the money the book will make this year will go to them because they are truly great people and they can do more good with $1000 than I can. 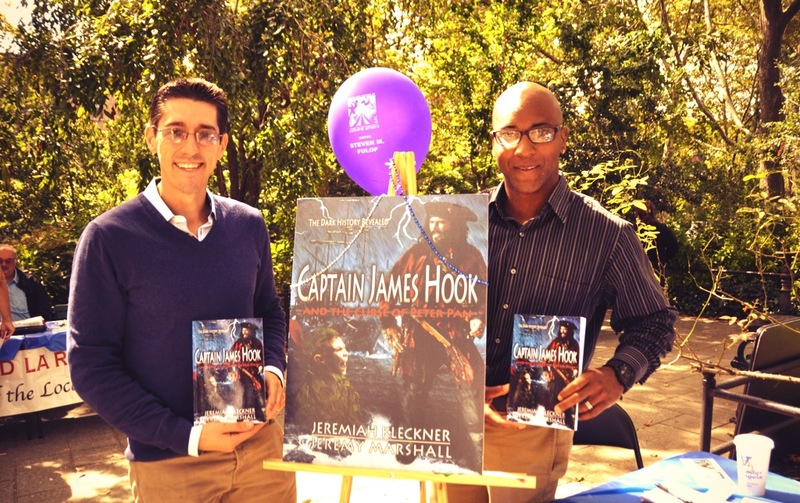 Jeremy Marshall and I are showing off our display at the “Tales of Our Cities” event in September 2013. In the spring of this year, I contacted the Jersey City Free Public Library regarding their fall event. The “Tales of Our Cities” event in September was a great way to gain exposure for the book. We signed a few copies and I did a reading for the crowd. In addition, the library bought ten copies for their use. The platform was important, but the push behind our involvement came from my status as a local. 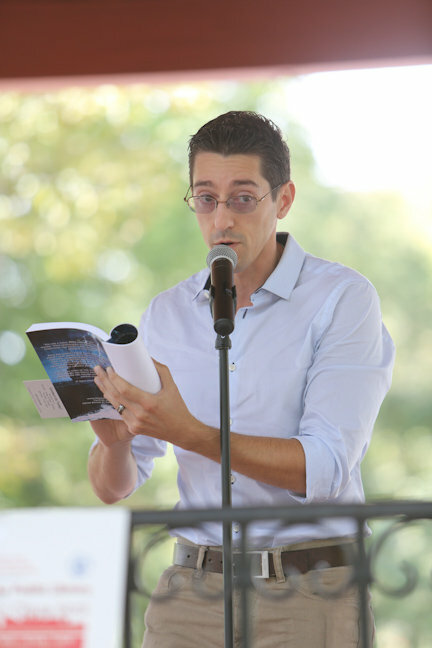 I read for the crowd at the “Tales of Our Cities” event in Jersey City. Business owners are shrewd, and for good reason. They need to be certain that what they are doing is good for them and for their customers. Two places in particular have opened up to me and to the book. Yes, the global platform gives me credibility in an anonymous and ambiguous way, but living in Jersey City is a key factor in our agreements. Jersey City Free Books is located on Griffith Street in Jersey City Heights, blocks from my door. Books are collected for trade in a manner that fits everybody’s ideal of a socialist utopia. The concept is simple: take a book, leave a book. There is no money exchanged and the books are generally not tracked or catalogued. I dropped off a few copies for them to give away and, in return, the owner posted on his Facebook page. The stand at JC Made where you can find our book for sale. JC Made is a store that sells work exclusively from artists who live in Jersey City. When you walk in, you will see a collection of vases, t-shirts, lamps, cards, and now… books. 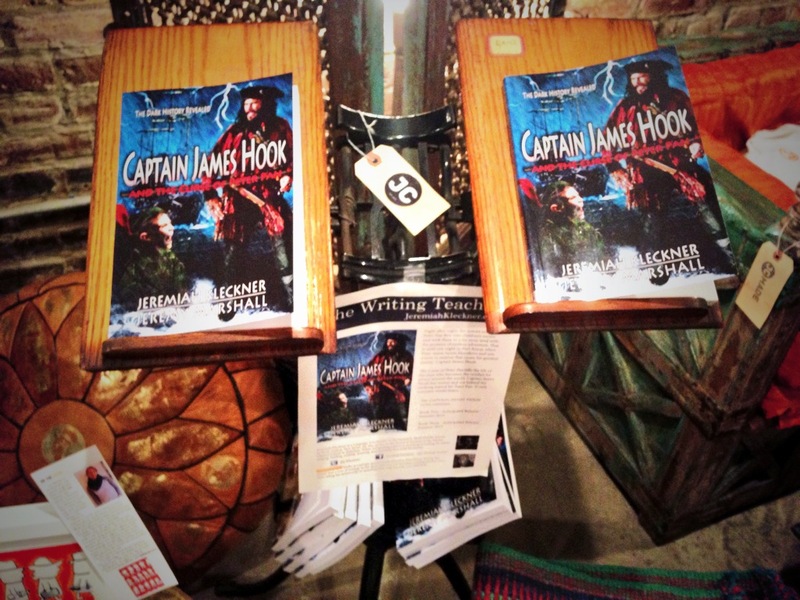 On Friday, I signed a contract to sell my book there, making it the first place where you can walk in, see a copy of Captain James Hook and the Curse of Peter Pan, and pay for it at a register. Again, the Amazon sales and ranking gave me a platform, but my local status made this possible. Building a writing career, while climbing in your main career, is hard when you are doing it on your own. However, if you look closely enough, local opportunities are all around.